Puffins are one of our favorite birds, and we planned a trip to England to try and visit some of the nesting islands. And I said try because getting to land is totally weather dependent. Puffins are seabirds and only come to land in the summer, to nest in burrows, and when the offspring are ready, they go back to the ocean, where they stay until the next breeding season. Chicks follow on their own a few days after the adults, and will not come back to land until they are ready to breed themselves, which could be from two to four years. They are nick named “clowns of the sea” because of their colorful and funny appearance. At the end of the breeding season, they have a family to feed and will come to land with a mouthful of sand eel (in the case of England), otherwise they feed in the ocean. They have serrated bills, so they can stack fish after fish on it. 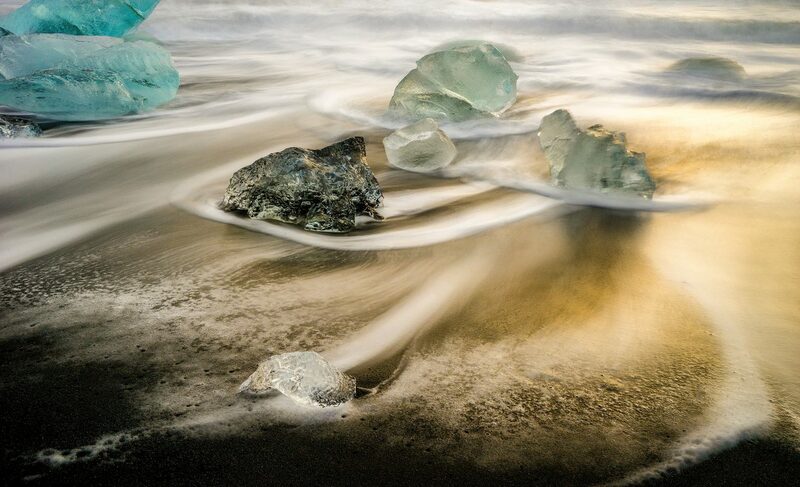 Of course, this is the time most photographers prefer to visit the islands. 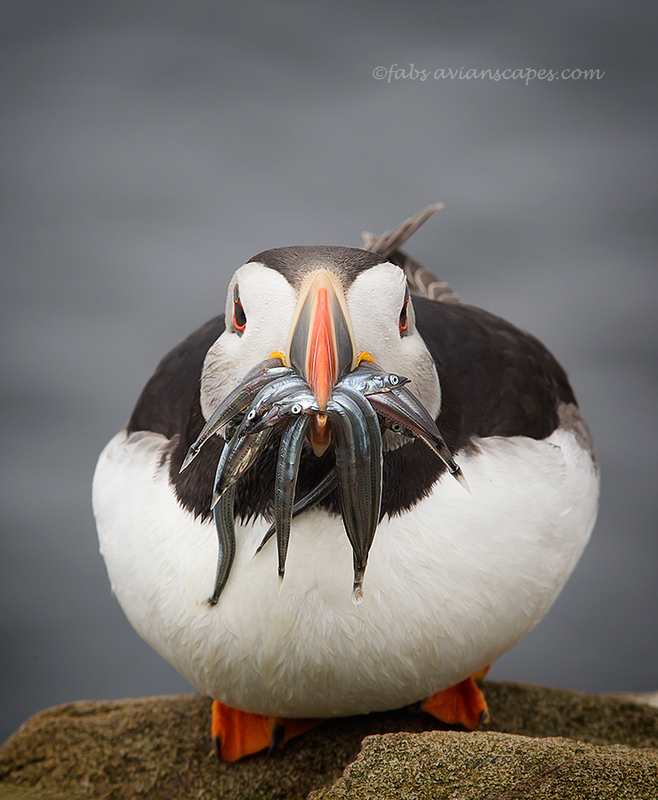 This image was captured at the Farne Islands, where there is a huge colony of Puffins and other birds. I had hoped to be able to get close-ups and flight images, and took a couple of cameras and lenses, as most nature photographers always do. This day was on the tail end of the trip, and carrying heavy equipment around for several days in a row can get to me. Since the birds are really close to you at some parts, I decided to go with just the hand held lens and tele-converters. I was seating on a rock very close to the small dock of the first island, very close to the cordon they keep for bird safety, enjoying their behavior and waiting for opportunities. This little fellow landed on the rocks across from me and just sat there. I wished I had the 500mm with me then, but this was really no too bad. Light was poor, but not horrendous. Overcast days are perfect for this type of subjects because the tonal range can be captured easily with the low contrast. I had been shooting in manual mode, at f/5.6, capturing flight to maximize my shutter speed. My pre-visualized image was a head on perspective and immediately knew that f/5.6 was not going to work for me. The subject was relatively close to me, making depth of field smaller and I wanted a perpendicular perspective in relation to my sensor. I had to close my aperture and still keep enough s/s to render a sharp picture without a tripod. The bird was not in a hurry. Apparently, he was waiting for photographers and birders to clear the path to his burrow. My background was the ocean, quite far, so I had no penalty to pay for using a small aperture. f/11 seemed like a good choice, allowing me 1/640 speed, which was plenty, since I have a steady hand, plus digging my elbows firmly into my knees, created an “anatomical” tripod. My only concern now was his pose. Considering the roundness of his head, I had to make sure that both eyes were visible in the shot. So taking more frames than I needed was my way of making sure to get the perspective I wanted. After the fact, I find the image to be almost comical, with his rounded body being consistent with the amount of food, even if it was not for him. That’s when I decided on the caption. In web presentation, a catchy caption can help your picture get more views. Although I think the Puffin makes a strong image, most of us can relate to the thought of postponing the diet to a Monday that never comes. This was converted from RAW in Lightroom 4, no exposure adjustment necessary. Luminosity noise a few points over default, and a few point of sharpening (while holding the alt/option key that makes it B&W to see how the edges look). Cropping off the sides, maintaining the vertical framing intact. Given the symmetrical quality of the subject and given that it is a vertical frame now, I chose to keep a centered composition. One light pass of Topaz Denoise on a layer, masking the bird, to keep the background clean and in Nik Color Efex 4, the filter Darken/Lighten center, adjusting the position and size of the center and keeping the brightness setting there at 0%, only reducing the brightness of the edges. For web use, resize and use Nik Sharpening as a brush, only on the subject. Work your subject! Whenever you have the time, try different settings, consider and weight your choices, as in photography there are a lot of compromises to be made. Never assume you got “the” picture, always take more for insurance, especially when you do birds in action, the tend to close the nictitating membrane, giving you a great picture with an unusable eye. Although I am a big fan and enjoy spending time in the computer with my images, try to get the best possible frame at capture. You will have a better image all the time if the initial capture is the best you can possibly do. Do not rely on PS to fix technical flaws. It needs good raw material, no pun intended. My husband and I are a shooting team besides a couple and we inspire and complement each other. We love nature, and specialized in birds. Although we are privileged to live in Florida, where there are plenty of subjects, we travel to foreign locations in pursuer of certain species. I am a retiree, holding a part-time job as Adjunct Faculty at Miami-Dade College, where I enjoy pulling the photographer out of my students. Teaching is very rewarding and you get motivated as you motivate others. this is a truly remarkable puffin image! best to you & Al. Fantastic detailed article, and some many tips.. Always a breath of fresh air to read your articles!! Thks so much for sharing…. I follow your work via Fotonatura and I just wanted to express my admiration for it. Many of your photos are source of inspiration when I go to take my own images. Puffins are one of my favourite birds too, and I try to take one photo like this for a long time. The next time I will go to a wildlife excursion I will remember it. Thanks for sharing your photos and your knowledge with us. Reblogged this on Pgsanap's Photography.